We all know that once picked nutrients decrease in produce. See graph to the left, clicking will enlarge it. 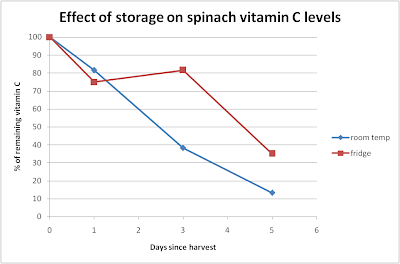 Unsurprisingly unrefrigerated spinach leaves soon loose all of their vitamin C. However refrigerated spinach also rapidly lost 25-30% of the vitamin C after one day in storage. It seems to then plateau, but between the 3rd and 5th day rapid loss occurs leaving less than 50%. Given that it takes at least 2-3 days for spinach to appear on the shelves it has lost a good proportion of it nutrients.... so grow your own or eat it quickly. Oh and by the way this data was publish in 1936. Reference: Ijdo, J., The influence of fertilizers on the carotene and vitamin C content of plants. Biochemical Jounral vol 30 no 12, 1936.